Increasingly, epidurals are used after serious accidents, including motor vehicle accidents, in treating neck and back injuries. Unfortunately, rushed emergency room and surgical care can result in serious complications and permanent injury arising out of epidural injection malpractice. 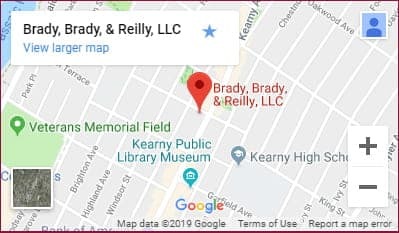 At Brady, Brady & Reilly, LLC, in Kearny, New Jersey, our lawyers are experienced in the investigation and pursuit of claims on behalf of victims who have suffered serious injury caused by epidural injections. In most cases, a trained anesthesiologist administers an epidural injection. Due to the proximity of the spinal cord, it is important that each injection is handled with extreme care. Negligence and mistakes during the injection can result in serious and permanent injury, including paralysis. Instances of negligence include performing too many injections, administering an unnecessary epidural, direct injection into the spinal cord, injection by an untrained professional and failure to recognize improper treatment. When filing a complex medical malpractice injury claim, it is important to work with an experienced legal team you can trust. Our attorneys have extensive experience working with medical experts and other professionals who can assist in collecting relevant evidence for your case. While we are skilled in negotiations, we are also board-certified trial attorneys who are prepared to take even the most difficult cases to court. Free consultations · Evening, hospital and in-house visits · Spanish and Portuguese language services available · Se habla español · Call (201) 997-0030 or contact us by e-mail to arrange a case evaluation directly with a North Arlington epidural injection injury attorney.